This post was written by peterjmurray on December 14th, 2014 12:58 pm Comments Off on CHRISTMAS IS COMING! Well done, Matt - glad I only watched! Firstly, can I apologise to those fans who regularly follow my blog! I’ve been so busy visiting schools and in between trying to keep up with my writing…hence Ive just not had time to keep up my blog. That’s my excuse and I’m sticking to it! Well, now the term has finished for us, and what a term! It has been one of the best ever. After our week on the Wirral, we spent a happy time around our local South Yorkshire schools, visiting Rawmarsh Rosehill Primary in Rotherham, Sir Edmund Hillary Primary in Worksop, Maltby St Mary’s near Rotherham and Birkdale Boys’ School in Sheffield. All of these schools were a real pleasure to visit before we made the long trek down to Billericay in Essex…and then onto our final school of the term, Mortimer St Mary’s, close to our rural retreat in Berkshire. 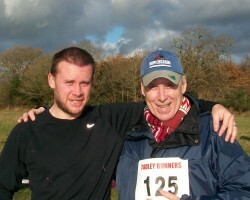 In between all of these visits, I made a real effort to keep up my fitness and run at least 3 miles 2 or 3 times a week, but I have to say I declined to run the Tadley 5-miler, which our son and great runner, Matthew, endured. It was reported afterwards by all entrants to have been one of the most brutal cross-country runs ever endured by anyone! Thank goodness I declined…I think it would have finished me off! Rawmarsh Rosehill– young Aidan – his mum wasn’t sure whether or not he would enjoy the scariness of our books and presentation. He finished up hanging onto every word and was the first in the queue to purchase his Mokee Joe book and have it signed. There was a huge buzz in this school and Mr Wagstaffe and his staff are to be congratulated on the way they have created a fantastic reading culture. Sir Edmund Hillary Primary – Can we ever forget the teacher who finished up a victim of the Moonwailer? He left school laughing about the threat and never even made it to school the next day. In fact, a picture of the teacher was texted to the acting head, Mr Stone, and it showed a sorry sight of the victim covered head to foot in bandages plus numerous scratches and abrasions to the face! I will request a copy of the pic to add to this blog…if the school don’t think it’s too gruesome! We loved our visit to this school and can’t wait to return next year. Maltby St Mary’s Primary – A fabulous little school which always provides a warm welcome. We always remember it because our niece and nephew went to this school more years ago than we care to think about! Birkdale Boy’s School – Will we ever forget the ‘marathon’ book-signing which was so well-organised we got through the whole thing in just over one hour (that’s all the time we had!). Pip Birch and her team did us proud. We love this school and the area is special to us because it’s where Kath was born and brought up. Billericay School – the school where Lauren was currently an X-factor semi-finalist. Sadly, she is now out of the competition. Our good friend Jacqui Clare and her librarians organised a wonderful return visit for us and the Year 7’s went ‘mad’ for our books…Scabbajack proving the most popular. 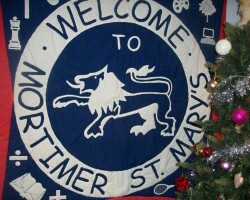 Mortimer St Mary’s Junior School– We had a great presentation of our ‘super scary’ books at this school. Mokee Joe or Freddie Kruger?? There are so many fans here and it seems just about all of them have now read our Mokee Joe series. We will always remember the ‘Christmas Jumper Day’ when we visited the next day to carry out our book-signing. The sight of 150+ pupils wearing their brightest, cheeriest Xmas jumpers and all in a good cause (Children in Need) was a wonderful sight. Kath and I made our own donation – well…it was only right as I wore my brightest jumper too…and it was really bright! To celebrate the end of a great term, Kath and I immediately headed for South Yorkshire to join our family in a fancy-dress Christmas disco. 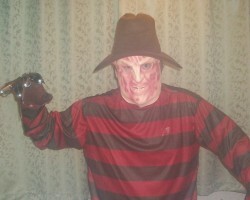 I couldn’t resist going as one of my all time heroes, the infamous Freddie Kruger! Hope you like the pic. WATCH THIS SPACE – as they say! Have a great Christmas and a wonderful New Year in 2015 wished to all our fans out there.